McCarran International Airport (LAS) in Las Vegas has partnered with Four Winds Interactive (FWi) to create its own digital signage program. 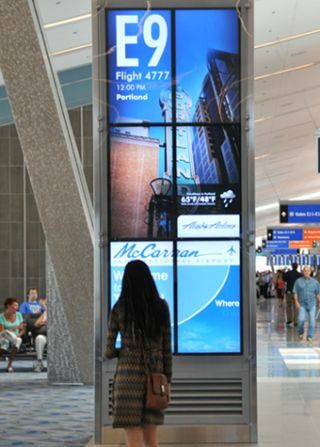 In June, McCarran opened its new Terminal 3, which features hundreds of digital signs to help passengers better manage their travel-related activities, including interactive digital airport directories and double-sided video walls serving as Gate Information Displays outside of each arrival and departure gate. Double-sided video walls featuring six portrait screens per side reaching 15 feet tall are placed near departure and arrival gates. Content on the gate signage includes real-time flight information, as well as destination-specific items such as weather forecasts and iconic photo backgrounds of the travel destinations. To remind travelers of the excitement of Las Vegas, synchronized videos of falling dice or slot machines in action are set to play at the top and bottom of the hour on the video walls at every gate in the terminal. The digital wayfinding aspect of the signs was a crucial element throughout the development and planning stages of the new terminal project. Emphasis was placed on the use of 3D custom floor maps, with more than 1,500 path-finding directions plotted to help guide visitors to various destinations inside McCarran. Through the digital wayfinders, travelers are able to find information about shopping, dining, airport clubs, and other airport amenities. The “map it” feature enables travelers to see an animated visual route from their current location to their destination, as well as turn-by-turn directions. These directions can be sent from the wayfinder to the travelers’ smartphones via a QR code.